Today is my second lens day, my second cataract surgery (for the left eye), my second adventure with an AcrySof IQ Aspheric Natural IOL (intraocular lens), from Alcon Laboratories. Since this is a medical device, it comes with a user’s manual / product information booklet, which is printed in incredibly tiny print in a 3×5 booklet. But is not without linguistic interest. That will take us to Texas and Switzerland. It will all end in food, specifically a type of dried, split legume seeds. Which will take us to South Asia. Never complain that I don’t take you out. Alcon is [a] global medical company specializing in eye care products and headquartered in Hünenberg, Switzerland. Alcon’s American headquarters are located in Fort Worth, Texas. Alcon is a subsidiary of Novartis. 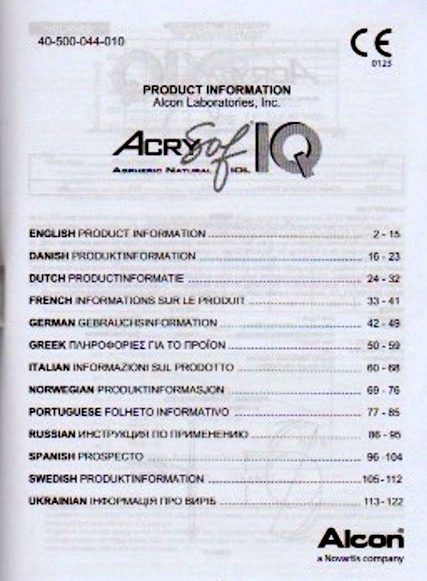 The booklet has user’s information, but the users in question are eye surgeons, not their patients, so the information is about storing and installing the lenses, plus technical details about the lens’s performance (in charts and graphs). Intraocular lens (IOL) is a lens implanted in the eye as part of a treatment for cataracts or myopia. … Insertion of an intraocular lens for the treatment of cataracts is the most commonly performed eye surgical procedure. Surgeons annually implant more than 6 million lenses.The procedure can be done under local anesthesia with the patient awake throughout the operation. The use of a flexible IOL enables the lens to be rolled for insertion into the capsule through a very small incision, thus avoiding the need for stitches, and this procedure usually takes less than 30 minutes in the hands of an experienced ophthalmologist. The recovery period is about 2–3 weeks. My Alcon lenses are aspheric, not spherical, that is, lenses “whose surface profiles are not portions of a sphere or cylinder” (link). 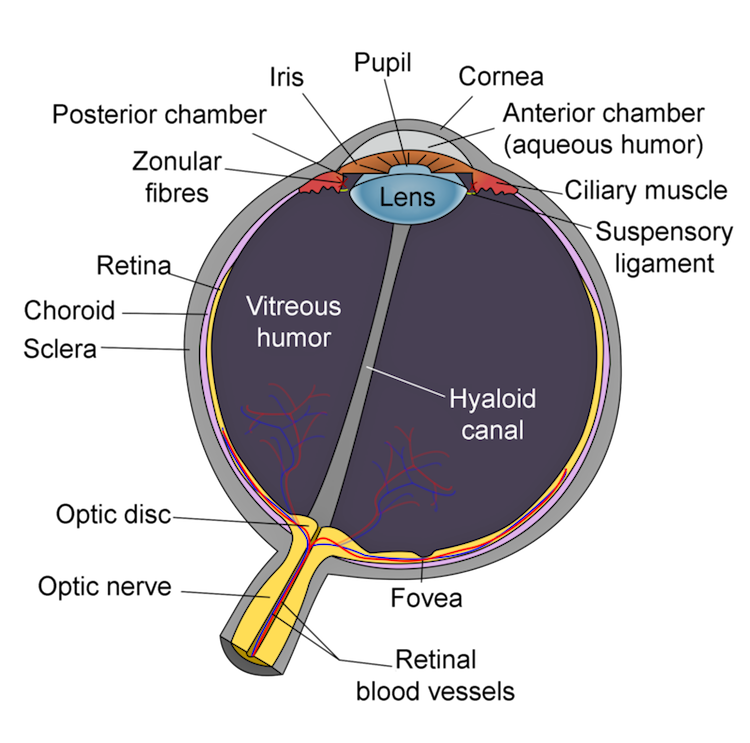 The lens is a transparent, biconvex structure in the eye that, along with the cornea, helps to refract light to be focused on the retina. 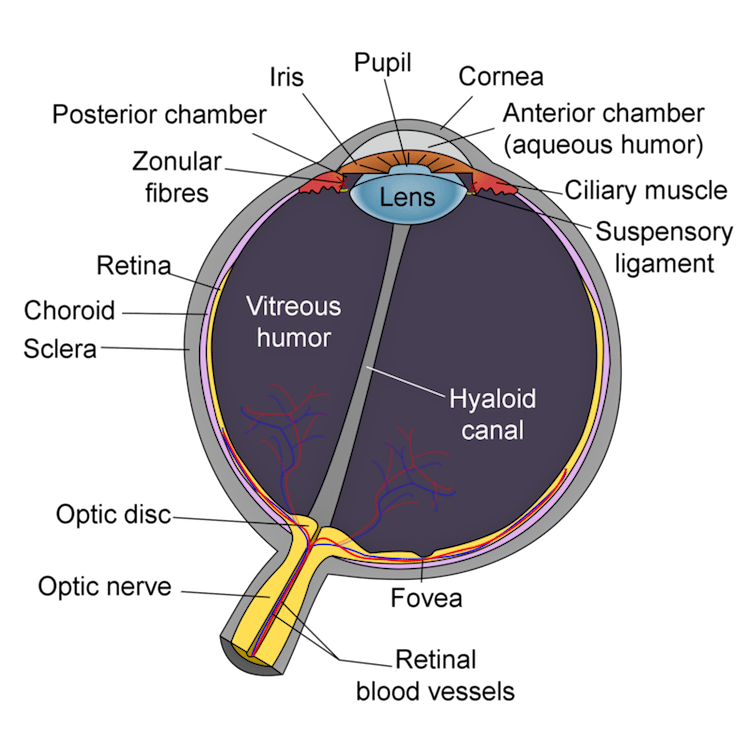 The lens, by changing shape, functions to change the focal distance of the eye so that it can focus on objects at various distances, thus allowing a sharp real image of the object of interest to be formed on the retina. This adjustment of the lens is known as accommodation. Accommodation is similar to the focusing of a photographic camera via movement of its lenses. noun lens: [a] a piece of glass or other transparent substance with curved sides for concentrating or dispersing light rays, used singly (as in a magnifying glass) or with other lenses (as in a telescope); [b] the light-gathering device of a camera, typically containing a group of compound lenses; [c] Physics an object or device that focuses or otherwise modifies the direction of movement of light, sound, electrons, etc; [d] Anatomy short for crystalline lens [the transparent elastic structure behind the iris by which light is focused onto the retina of the eye]; [e] short for contact lens. ORIGIN late 17th century: from Latin, ‘lentil’ (because of the similarity in shape). The English noun lens was first used for the crucial parts of optical instruments (magnifying glasses, telescopes, binoculars, and microscopes) and then extended to the fiunctionally similar part of cameras and to the physically and functionally similar part of the human eye. … Usually eaten with rice or rotis, the lentil is a dietary staple throughout regions of India, Sri Lanka, Pakistan, Bangladesh and Nepal. As a food crop, the majority of world production comes from Canada, India and Australia. Dal (also spelled daal, dail, dhal) is a term in the Indian subcontinent for dried, split pulses (that is, lentils, peas, and beans). The term is also used for various soups prepared from these pulses. 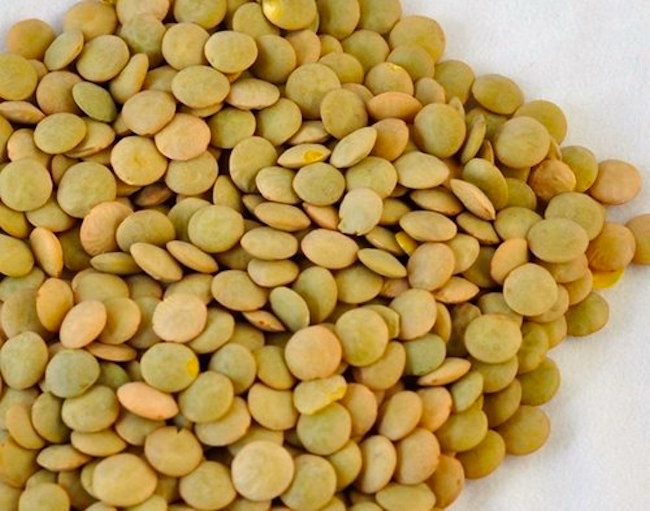 These pulses are among the most important staple foods in [South Asian] countries, and form an important part of Indian, Nepalese, Pakistani, Sri Lankan and Bangladeshi cuisines. This entry was posted on October 9, 2017 at 5:39 am and is filed under Language and food, Language and the body. You can follow any responses to this entry through the RSS 2.0 feed. You can leave a response, or trackback from your own site. Last year I got “toric” intraocular lenses – they have a cylindrical component that corrects your astigmatism. Big improvement in my vision on account of that. Medicare doesn’t pay for them – a thousand bucks each – but worth it.